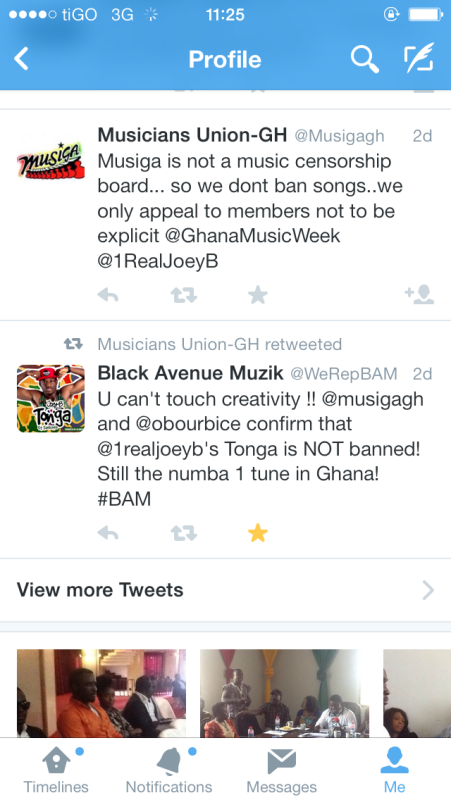 Currently the biggest song in Ghana, ‘Tonga’ by Joey B from the Black Avenue Muzik label has made waves in under a month after its release on the 19th of December 2013. Tonga shot to the number 1 position on almost every single music radio and online chart in Ghana barely a week after its release with numerous dance videos on youtube shortly after the label and Joey B announced the ‘Tonga Dance Competition’ via their official twitter acocunts. 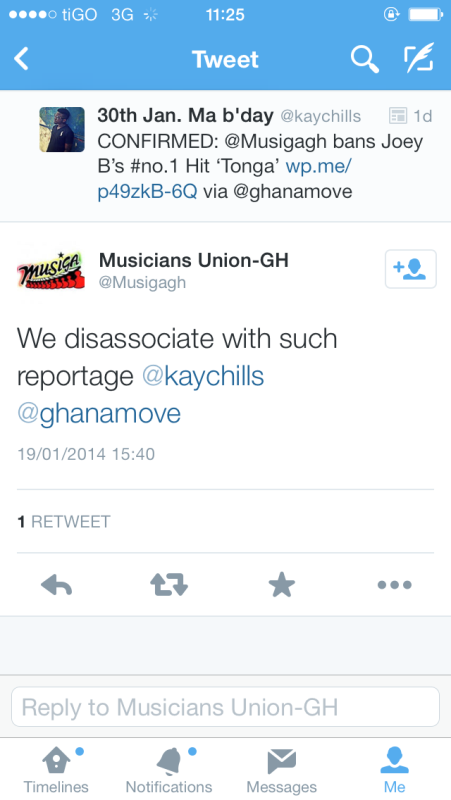 A few days ago some mischievous bloggers began circulating false rumours on their blogs and sites announcing the ban of Joey B’s ‘Tonga’ from Ghanaian radio by the Musicians Union of Ghana Board. This is false and has been widely condemned by MUSIGA Boss, Bice Osei Kuffour (Obour), and Hiplife /Hiphop producer Hammer who is also head of the Hiplife and Hiphop division at MUSIGA speaking to the Black Avenue Muzik team. 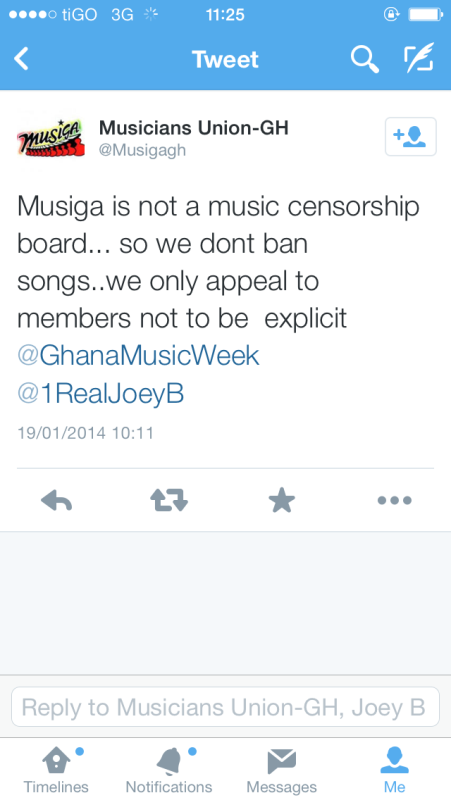 MUSIGA announced via their twitter account’s tweets that they have not banned any song in Ghana, have not banned Joey B’s Tonga from Ghanaian radio and will not ban the song. The song has no profanity and is the creative use of innuendo’s says ‘Black Avenue Muzik’ boss and rapper D-Black who is the executive producer for Joey B. It’s wordplay, It’s creativity, It’s genius to be able to paint a picture in people’s minds using innuendo’s throughout the record and top charts at the same time, D-Black said speaking to Koforidua based radio station ‘Vision Fm’ over the weekend. Definition of Innuendo: an allusive or oblique remark or hint, typically a suggestive or disparaging one. Joey B broke away from the norm, we hadn’t even printed the promo cd’s and the song went viral, Godwin Nyamador a.k.a Gee , Joey B’s manager told Radio Universe host ‘Chef’ on Monday morning. Speaking on this issue ‘Joey B’ who isn’t perturbed by this issue is confident his song will make it, if not top the Ghana Music Awards nominations this year. There is a however a radio version of ‘Tonga’ for radio play which has certain parts of the song edited for radio play for the nay sayer’s and media men who feel there is the need to clean up the song. ‘We’ve done that for you’. We want the entire country and continent to enjoy the music we made for the people. The BAM rapper / singer ‘Joey B’ is highly tipped to win Best New Artist and Song of the Year at this year’s Ghana Music Awards with his Tonga ft. Sarkodie, Cigarette and Strawberry Ginger ft. D-Black and E.L songs which have done tremendously well in the year under review. 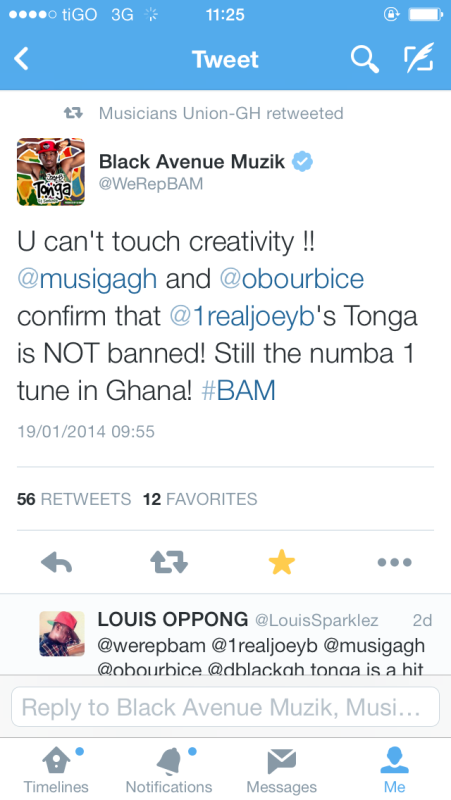 MUSIGA has NOT banned Joey B’s ‘Tonga’ 0 out of 5 based on 0 ratings. 0 user reviews.